I have backed four projects on Kickstarter so far. Three are in the price range of 5 to 25 € (give or take a bit as I’m too lazy to look up the conversion rates from $ etc.). The fourth was AU$ 129 (roughly $ 92) plus taxes and delivery ($ 33). This is three different currencies now. 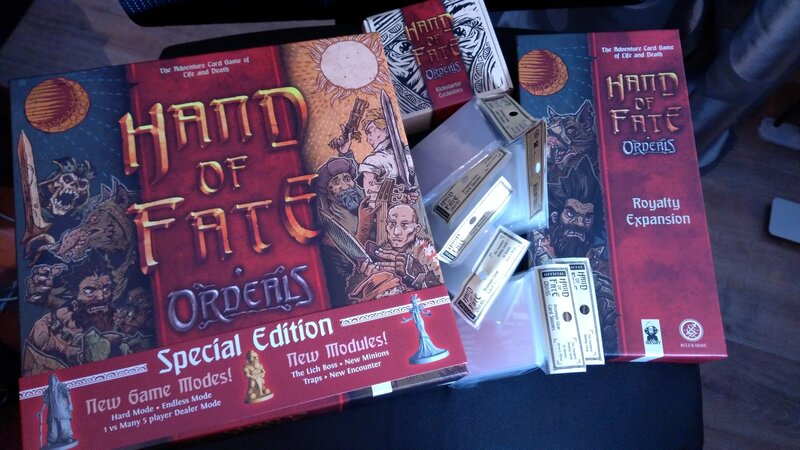 But let’s just say that it was a lot of money that I spent on Hand of Fate: Ordeals and I was nervous about the result. 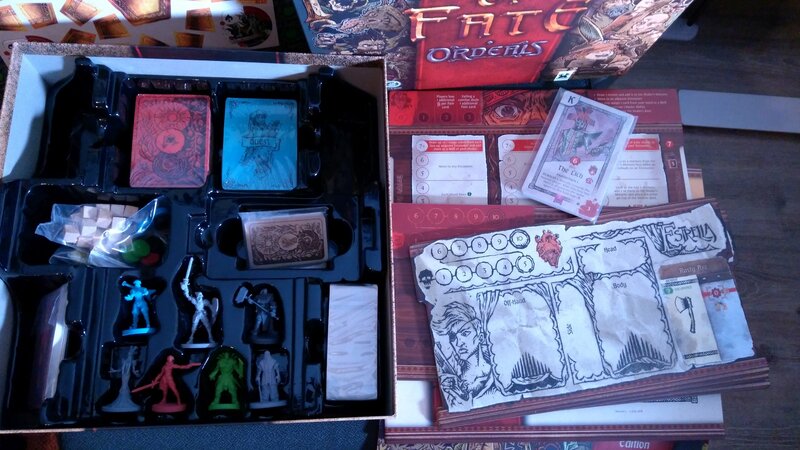 Hand of Fate: Ordeals is the board game version of the Hand of Fate PC games. Estimated delivery date was November 2017 which was officially pushed back during the campaign already as they reached their stretch goals and knew that these would take more time to develop. Thankfully, the company that made the board game (Rule & Make) gave regular updates to inform us of the process. 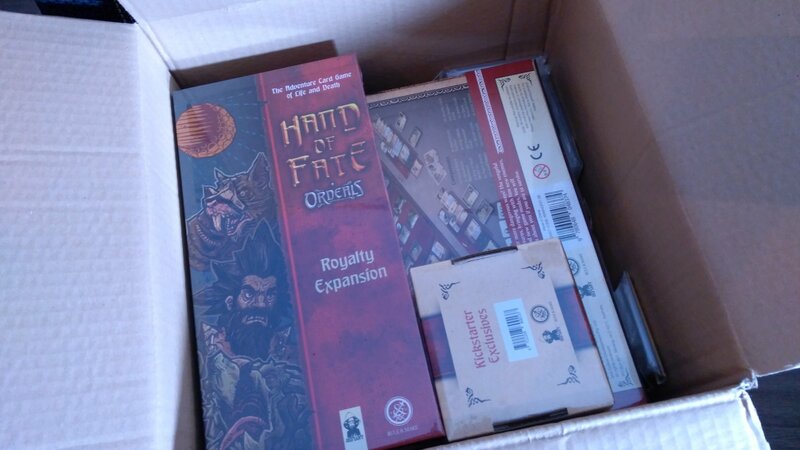 When delivery started at the end of November / beginning of December 2018, I got a bit anxious as people said that the miniatures were really bad. Also, there were some troubles with the logistics partners. It sounded as if the EU logistics partner had already sent out all game packages while lots of us hadn’t even received any email about the shipment. I finally got an email from the partner mid-December that we will get our game some point soonish. At the beginning of January, it was finally here (Christmas and New Years had delayed the whole process)! And boy, was I nervous. Of course I know that there is a huge risk backing some project and that you may not receive everything or anything at all as promised. But thankfully, both bookahnerk and I were just very happy with what we received. 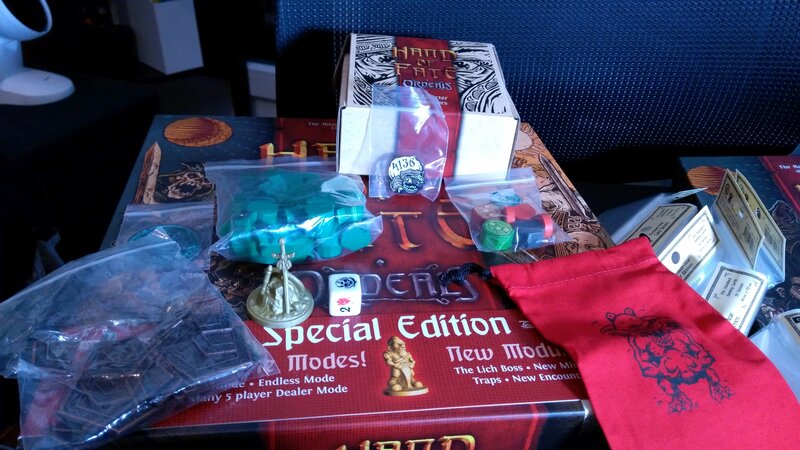 Everything was wrapped carefully in the package and the product itself (the game, the expansion and a little box with Kickstarter exclusive items) arrived unscathed! 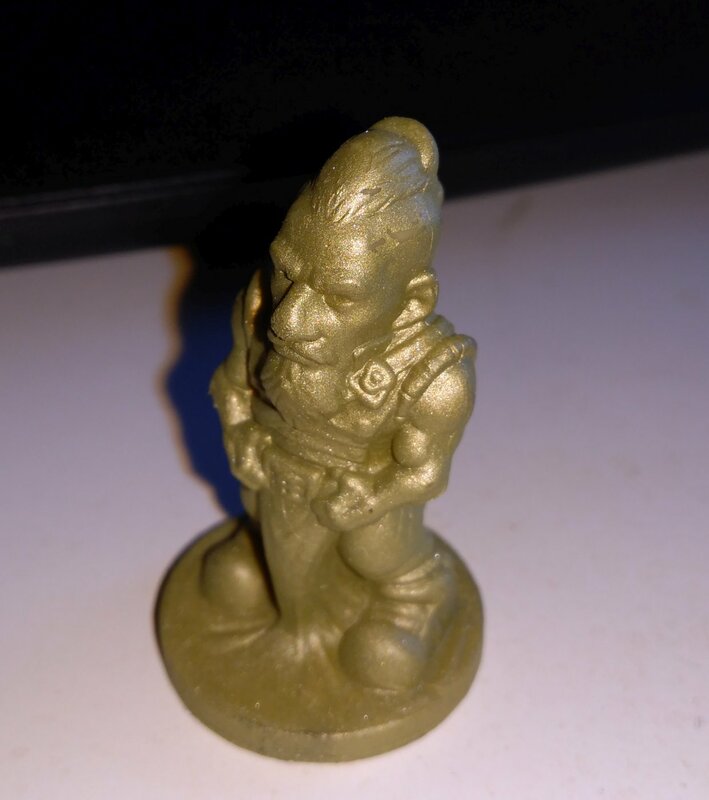 But yes, the miniatures aren’t as great as they could have been. 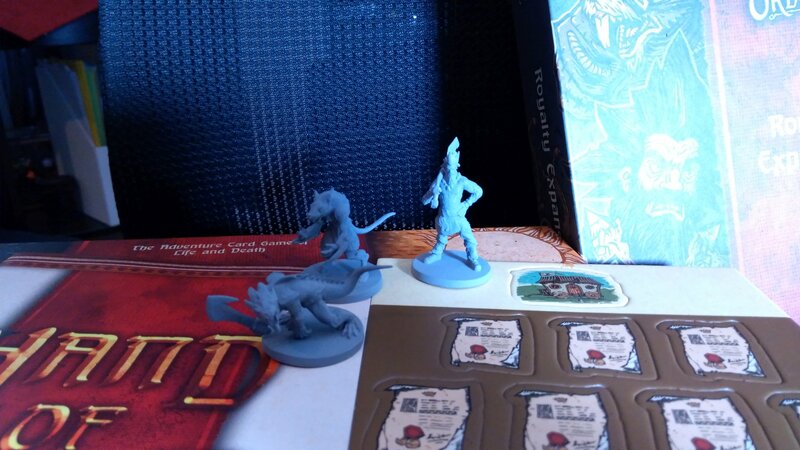 The primer is too thick and steals details of the miniatures which is a shame. You can read several complaints in the comments section of the Kickstarter project. After seeing these comments, we were expecting much worse, actually, which is probably why we ended up thinking it’s not that bad! But bookahnerk already said that he would like to remove the primer and paint them himself. We will see. What’s worse is the Kallas figure, actually. We already have a spot on his head where the golden colour is removed simply because a fingernail scratched it. This happened within the first few minutes of opening the box! 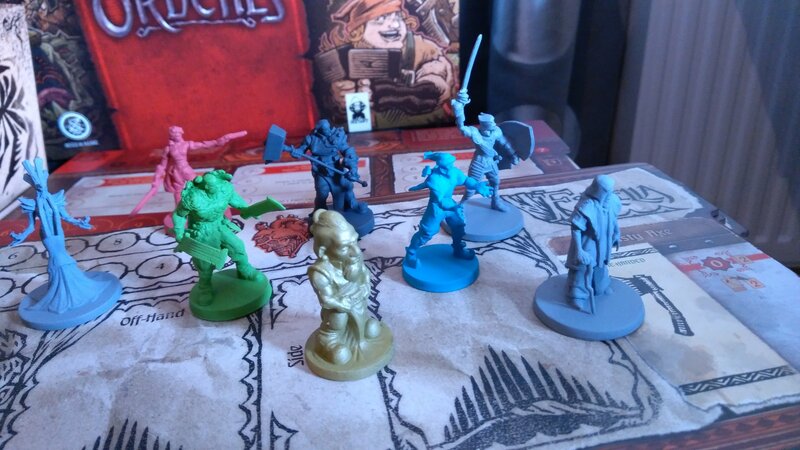 But this game is – thankfully – about more than miniatures. The main game board is rather large and very pretty if you ask me. If you know the PC games, then you’ll be familiar with the part in the middle: This is where you move your miniatures around to explore and engage with encounters. It is basically a card game where you build your deck while playing! The encounters can give you cards, allow you to buy new cards or start combat with minions – also represented by cards. It is actually quite complex to get into the game. We watched the “how to play” video that the makers recommended instead of reading the rules. Then we started our first competitive game and looked up details in the rules. Thankfully, they have also released a revised rulebook online which answers a few open questions and there is also a forum on BoardGameGeek where you can ask questions about the rules or about certain cards. This is also why I am not going into the rules or how to play any further. These resources are much better than my limited experience. We had ordered some sleeves as a paid extra for the “regular” sized cards. We like to do that with games that are more expensive. 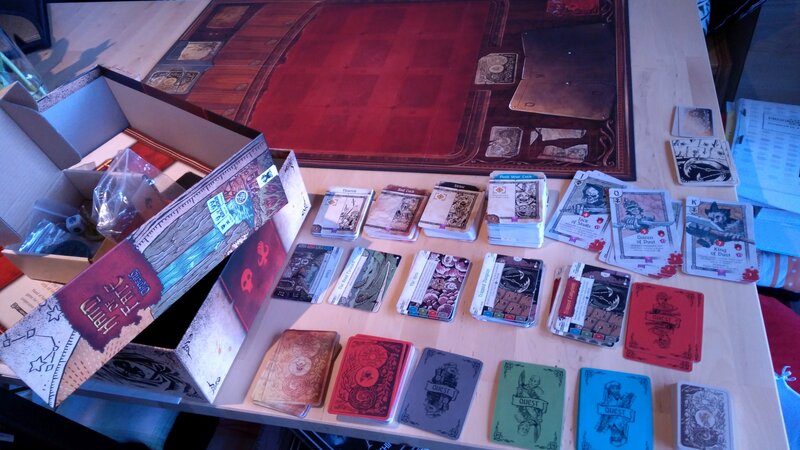 Now we just need to find sleeves for the tiny cards and the large ones as well. The cards themselves are nothing special, I would say, when it comes to their production value. They are not too thin and I think that even without the sleeves, you could play the game with no issues. The cards are robust enough to handle that! The art on the cards is impressive, though. Minimalistic on some cards – mostly the equipment, but coloured and very detailed on others, like the encounter cards. 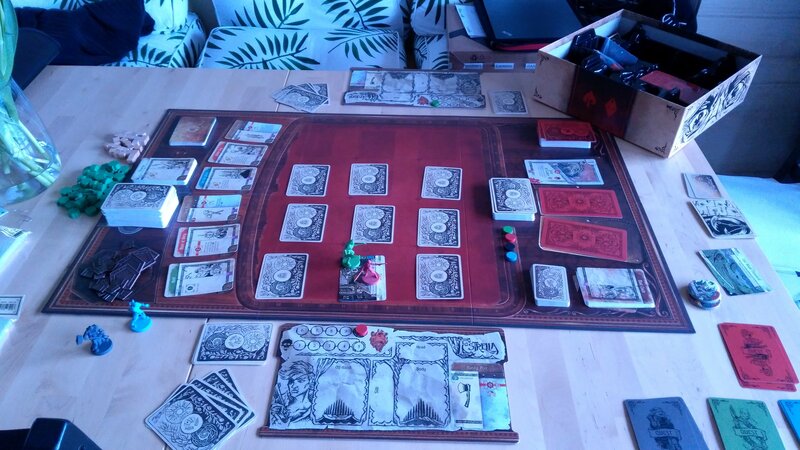 The player board can be used on either side. One side has a beige background, the other a darker brown one. I really like details like this. So far, we have played several rounds on two evenings. We just leave the board game on the table and return to it when we feel like continuing to play. This is not because the game is bad or boring. It’s mostly because we are still trying to get comfortable with the rules and everything. It’s not that complicated, but not that easy to remember all the details either. So we like to slowly play through it on several evenings, because the rules will stick in the memory more easily than if we play through the game once on one evening. We’re having fun so far, though. It’s very interesting to see how bookahnerk and I have different approaches to trying to build our card decks. Or, let’s say, bookahnerk has an approach while I go along with whatever seems most reasonable at any given time. I am pretty certain I am not going to win this game! It certainly does have an element of luck as you can get easier minions to fight or more difficult ones. And as with any deck-building card game, you can be lucky and get the cards on the hand that you need this round – or not. Another element is that you remove your hand after each round and draw five new cards. So you cannot plan several rounds in advance. Having certain cards in your deck that belong to a specific strategy still seems like a good idea, though. At least, that’s what I gather from bookahnerk’s play and how he’s slowly climbing higher on the fame ladder (that’s the victory points) while I started strong and am now humbly biding my time on the town encounter card trying to buy good new cards for my deck. Altogether, I do not regret buying this game at all! There were a few weeks in December when we weren’t certain when or if we would receive the game with no issues, but I think that was a miscommunication between the logistics partner, the makers and/or our interpretation of the delivery status (there were lots of EU customers who’d shared the same fears). 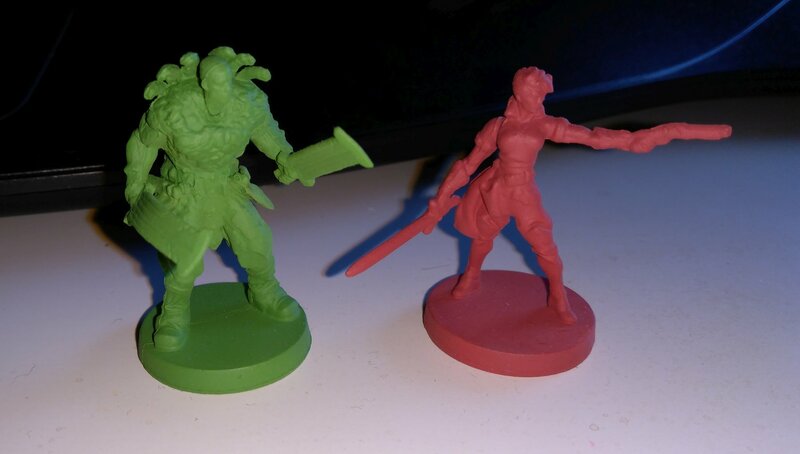 The miniatures are far from perfect, but you can play with them. I have no idea if you even need that Kallas figure or if it’s just a neat little extra. So far, we’ve kept it in the box and try not to touch it too often. 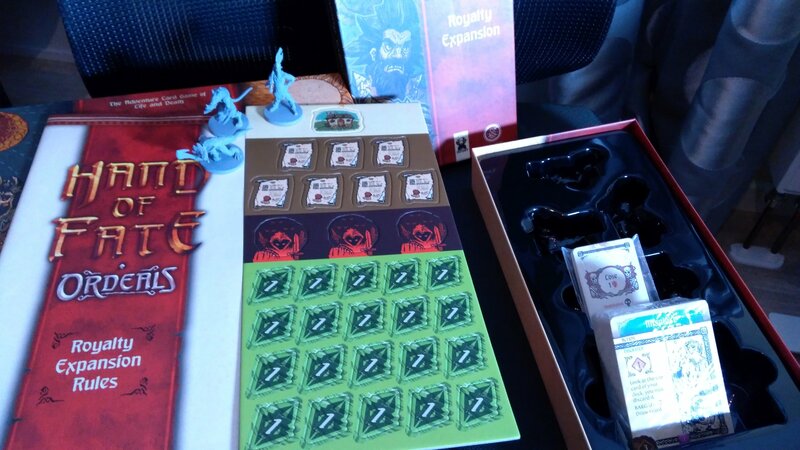 But other than that, the game components are gorgeous! Since we kickstarted the game, we even got metal shard tokens. 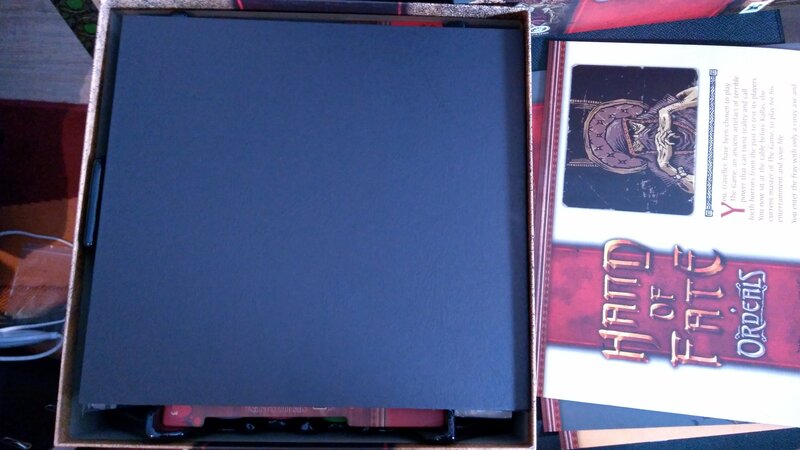 The regular cardboard versions are in the box as well, but why should we use those when we can have metal ones!